Home » Breech vs. Breach – What’s the Difference? When you accidentally divulge privileged information to an uninterested party, do you breach confidentiality, or breech confidentiality? Likewise, when you violate a set of established rules, have you caused a breach in protocol, or a breech in protocol? The answer to both these questions is the same. 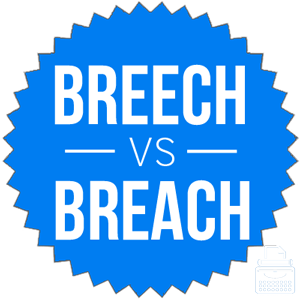 Breach and breech are homophones, which means that they mean different things even though they are pronounced the same way. In truth, one can be used as a verb, but the other cannot. As a careful writer, you will want to know the difference between these confusing words. Continue reading to learn more about breach and breech. What is the Difference Between Breech and Breach? In this post, I will compare breach vs. breech. I will use each of these words in at least one example sentence, so that you can see them in context. Plus, I will show you a helpful memory tool that you can use to make choosing breach or breech a little easier. What does breach mean? Breach can be a noun or a verb. As a noun, breach means a break or a hole in something. A breach in a dam, for instance, would let water pass through where it should not. A breach of protocol would indicate that rules were broken. The spies found a breach in enemy lines and were able to exit the city undetected. A breach in the fabric of my jersey meant that I needed to retire it from active rotation. Sometimes, breach is a verb, where it means to tear something or to break through something. Someone who divulges private information might accidentally breach confidentiality, or an iceberg might breach the hull of an ocean liner and cause a multitude of deaths when the ship sinks. A nail breached the tire liner of my bicycle, and I got a flat while riding home from work. I breach confidentiality when I include the full names of my clients in emails to outside parties. What does breech mean? Breech is a singular noun. It is almost always used in its plural form, breeches, to refer to short trousers fastened below the knee. These are the types of pants people commonly wore in the 1700s. Still, here are some examples. “Put on your breeches!” screeched the teacher. “I lost my breeches!” said the mayor of the city as he attempted to sneak out the back door of the brothel. While most people simply wear pants in the 21st century, breeches are still commonly worn by jockeys for riding horses. Now, let’s go over a trick to remember breech vs. breach. If you are using the word as a verb, choose breach. sBreech is not a verb. Breeches is an outdated type of trouser. Since breach and break are both spelled with the letters EA, it should be easy to remember that breach means a break or to break. Is it breech or breach? Breach means to break or tear something as a verb, and a hole or break in something as a noun. Breeches are a type of short trouser that are rarely worn today. 1 What is the Difference Between Breech and Breach?